One by on the leaves have been turning these past few weeks, bringing with them frostier mornings and chillier afternoon winds. The signs of the seasonal shift are like buoys guiding this little home in to the safe harbour of its annual autumn maintenance. We’ve been riding high on the summer waves this year. With the windows open wide from April til September, life swept over the doorsteps and with it the need for extensive housekeeping. Now the tide is turning and the heralds of the colder season are urging us to prepare for the long dark weeks ahead. I like to acknowledge the imminent heavy use of our home by giving it a little pep talk at the beginning of the hibernation season. 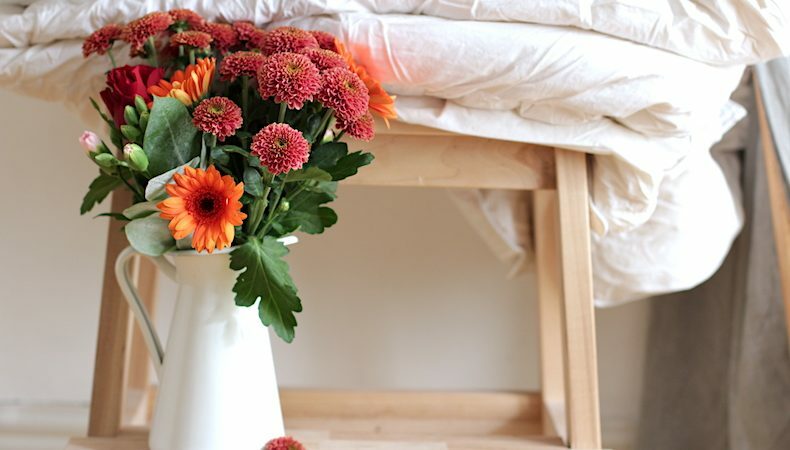 Much like my simple Spring Clean in April, it’s a mindful routine designed to prepare the house for the upcoming seasonal demands. 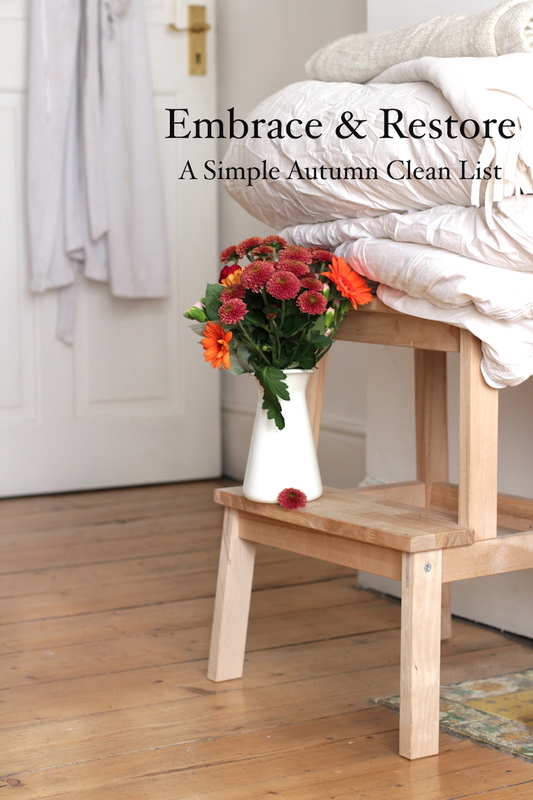 The focus of this Simple Autumn Clean is to make the nest and tend to the nagging tasks that inevitable come with the privilege of caring for your own home. Like with any un-tackled compilation of to do’s; at the beginning of October the list seems daunting and endless, dragging doubt about its necessity from every dusty corner. 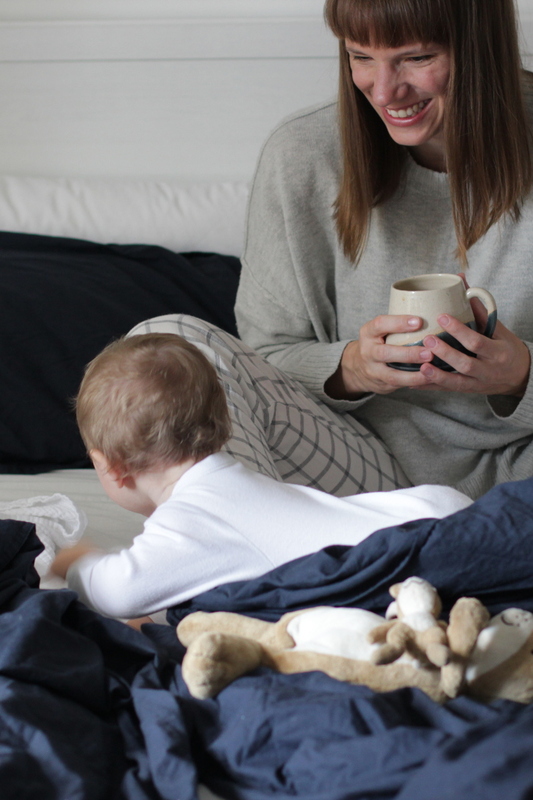 However as soon as the really cold days hit, I’ll be grateful for the thoughtful preparation – there is nothing worth than scrambling for extra blankets or working lighters when the toes get frosty. Clean windows and doors: Having been wide open for much of the lighter seasons, our windows and doors need a good wipe down now to let as much of that precious light in as possible. Wipe down windows with a simple vinegar solution and a leathery clothes. Scrub windowsills and doors with soapy water. Remove the cobwebs from any creepy crawlers that enjoyed the constant access throughout summer. 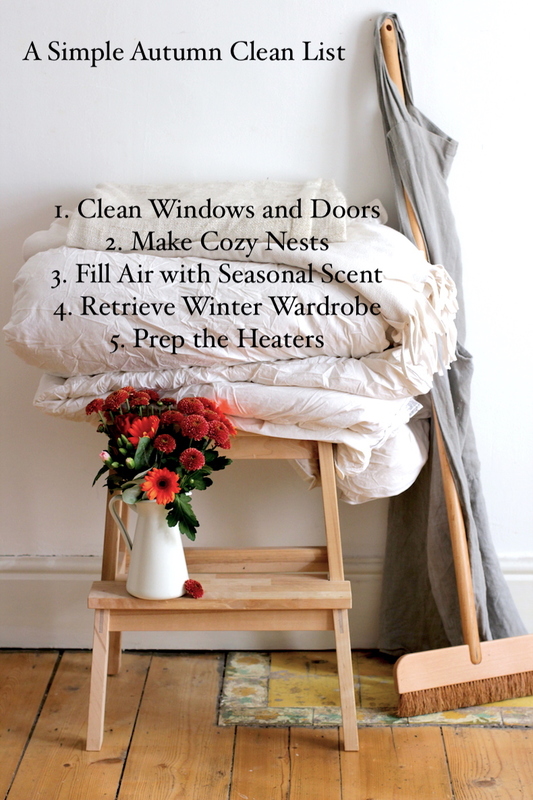 Make cozy nests: From the sofa to our bed, we add plenty of blankets and warmer duvets to help us keeping warm in the chillier months. Upgrade beddings and pillows. While the winter duvets air for the day, the summer ones will get a wash before they get stored. Pull out the blankets. 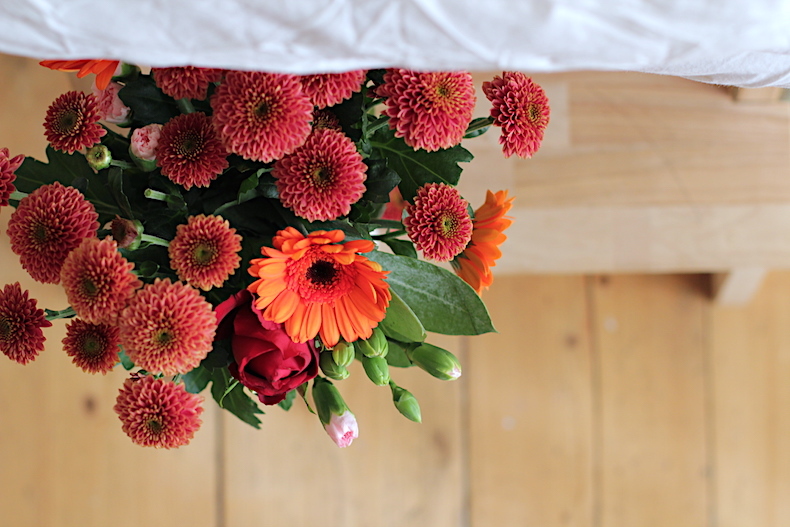 The light summery ones will now go to the bottom of the pile, while the heavy blankets come out of storage to be scattered around the house. Vacuum and turn mattresses. Before the thick winter duvets go back on, the mattress will get a vacuum clean; leaving it uncovered for the day with the windows open. Stock up on candles. I use a varied assortment throughout the winter, that is scattered all around the house for light and mood and of course a few scented ones predominantly in our bath- and bedrooms and on my desk. Fill pantry with dried spices and autumn finds for simmering pots. Cinnamon, eucalyptus and pine needles all help to diffuse any stuffiness from intensive heater usage. Remove dust catching cobwebs from the corners of your home. Retrieve winter wardrobe: While some family members 😉 wear their shorts all year round, most of us do a little wash, mend and swap now. Swap cloak room content. Admittedly our cloak room is a corner in the downstairs dining room. Nevertheless the summer sandals and sun hats will now disappear from here and our heavy boots and winter coats will take their place. Store away summer lights. Likewise with every woollen jumper pulled from storage a summer dress will be put away. Prep the heaters: Radiators and fireplace(s) get a good maintenance scrub to ensure we’re not just firing up the dust mites bottoms. Dust off the radiators. Wiping down the radiators with a damp cloth does wonders to their effectiveness, so does releasing any trapped air in them. Stock up on firewood. Goes along with giving the fireplace a quick sweep and checking that we have enough kindles and lighters at hand too.